680,000 Muslims To U.S. Under Obama – Just The Beginning, Get The Facts Here! The U.S. issued 680,000 green cards to migrants from Muslim-majority countries in the five-year period encompassing 2009 through 2013, according to Department of Homeland Security data. This Islamic “invasion,” as some are calling it, occurred on the Obama administration’s watch, with plans for 10,000 Syrian Muslims grabbing much of the headlines. But the actual number is many times higher with a refugee program that is rooted in the 1980s and has the support of both parties. The U.S. has brought in more than 1.5 million Muslims through the refugee program since the passage of the Refugee Act of 1980. They have been coming from Islamic states with active jihadist movements such as Somalia, Bangladesh, Burma, Iraq, Iran, Afghanistan, Bosnia and the Democratic Republic of Congo. To put this five-year tally – 680,000 – in context, it surpasses the total population of Washington, D.C., which is 660,000. Yet, the Gang of Eight immigration “reform” bill co-sponsored by GOP presidential candidate Marco Rubio would have tripled the number of green cards being issued. The data was released by Sen. Jeff Session, R-Ala., who serves on four Senate committees: Armed Services, Budget, Environment and Public Works, and Judiciary, where he is chairman of the Subcommittee on Immigration and the National Interest. Among those receiving green cards are foreign nationals admitted to the United States as refugees. Within one year, they must apply for lawful permanent resident status, also referred to as a green card, and are placed on a fast track to full citizenship, which is obtainable within five years. Refugees, which are hand-picked by the United Nations for resettlement in more than 180 U.S. cities and towns, have instant access to federal welfare and entitlements, along with local benefits and education services. These costs are not offset. The 680,000 number is not an estimate of total migration, as it does not include temporary migrants who return home, nor is it an estimate of population change, as it does not include births or deaths, among other considerations. There is no official tally of the Muslim population in America because the Census does not track religious affiliation. The estimates range from 2.8 million by Pew Research based on a 2011 study and 7 million as estimated by the Council for American-Islamic Relations. In fact, many of the recent terrorist attacks on U.S. soil have been carried out by Muslim immigrants, including the Boston Marathon bombing in 2013 and the Chattanooga shooting earlier this year. 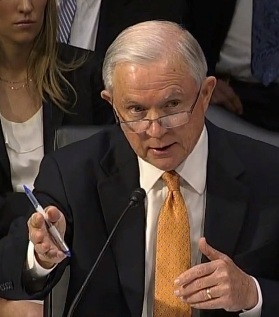 Sessions’ immigration subcommittee has documented 72 cases of Muslim suspects carrying out attacks or attempted attacks over the past year. He believes all of them are either foreign-born Muslim immigrants or their offspring and has asked the Obama administration to clarify their immigration histories, but the administration has ignored the request. Rubio told Fox News host Sean Hannity earlier this week that he would not use Congress’ power of the purse to shut off funding for the refugee program. Rubio said he’d prefer Speaker Paul Ryan’s plan, which would allow the Obama administration to continue on its resettlement binge – bringing in 85,000 refugees this year, up from 70,000 annually in recent years. Obama wants to increase the number of refugees coming to the U.S. to 100,000 in 2017. More than half of these refugees will come from Muslim-dominated countries with active jihadist movements. Assuming no change in visa policy, the U.S. can expect to give green cards to another 680,000 migrants from these countries over the next five years. A green card entitles recipients to access federal benefits, lifetime residency, work authorization and a direct route to becoming a U.S. citizen. The numbers could be higher still: Census Bureau data shows migration from the Middle East to be one of the fastest-growing categories. If left in place, Obama’s refugee plan would substantially boost the annual number of migrants from this region admitted to the U.S. who, in turn, would be able to petition for their overseas relatives to join them in America. Refugees and asylees from Iraq, Somalia and Iran alone accounted for 124,000 Muslim immigrants from 2009 through 2013. According to the U.S. Census Bureau, the foreign-born population in the United States is at a record 41.3 million. One-quarter of the U.S. population is now either foreign-born or has foreign-born parents. The Census Bureau projects the percentage of the population born outside the country will soon pass the highest percentage ever recorded and continue rising to new all-time records never before witnessed – unless Congress passes a law to reduce green card allotments. “Without such changes, the Census Bureau projects that, for each coming year the total number of immigrants in the United States will increase, the annual rate of immigrant admissions will increase, and the foreign-born share of the population will increase,” according to a statement from Sessions office.